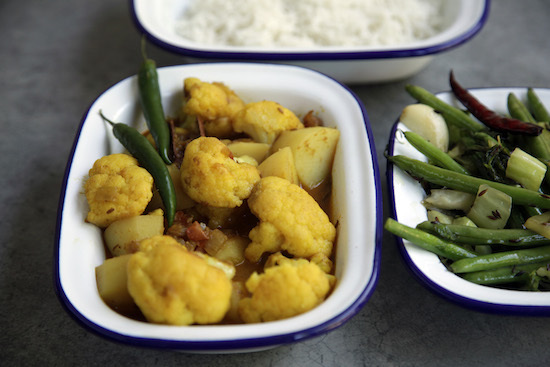 Light and fresh, this Bengali cauliflower potato curry comes is ideal for the warmer months of the year. Called Aloo Phulkopir Dalna, it’s a version of the famous Aloo Gobi, with a lightweight and gently spiced curry. Cauliflower is actually a winter vegetable in India, and is used in curries, vegetable sides, as paratha stuffing and even pickled. Despite the long list of ingredients, this recipe is straightforward and uses common spices. There are two techniques that are worth a special mention. The cauliflower is sealed here, helping it to cook and yet remain intact in the curry later. And the pinch of sugar in the hot oil adds a touch of sweetness and caramel colour to the dish. Keep a kettle of hot water handy to add while cooking as needed. Break or cut the cauliflower into medium-sized florets. Place them in a bowl and sprinkle the chilli and turmeric all over. Now peel and cube the potatoes, finely chop the onion and mince the ginger. Next bring a tablespoon of the oil to heat in a wok. When it’s hot, toss in the spice-coated cauliflower and sauté for two minutes. Then remove with a slotted spoon back into the bowl they were sitting in. Now, pour the remaining tablespoon of oil into the work and add the sugar, bay leaf, cinnamon, cardamoms and cumin seeds. As they sizzle up, stir through the chopped onions and ginger and fry for five minutes until golden. While it’s cooking, dice the tomato and add it in when the time’s up, along with the ground coriander and cumin. Sauté your spice paste for five minutes adding two-three tablespoons of warm water until the raw smell goes. Next, toss in the potatoes and stir for another five minutes, adding a splash of water if the spices start getting stuck to the bottom of the work. Cover the wok to speed things along. When you can insert a fork into the potatoes, toss in the cauliflower, a cup of warm water, cover and bubble for five to seven minutes until they are soft. Stir salt in to taste and sprinkle the garam masala all over. Serve this cauliflower potato curry with steamed rice and some ghee. Side order of greens optional! is it necessary to add onion ? but otherwise its very mouth watering recipe!! Mouth-watering recipe, Thanks for sharing this. Cooked this today – slightly different from ma’s but so so yummy!